People often ask chefs what they would order for their last meal if they were on death row. I Don’t really understand why people associate us chefs with capital crime, the statistics don’t seem to support such assumptions. Regardless, marrowbones are popular answer to the question because they are mostly beef fat and we tend to have very little dignity or self-control. Imagine taking a knife full of warm, congealed lard, dipping it in clotted blood, and then eating that over rice. Sound good? You’ll love this dish. Not so much? Eat the more normal beef that fell off the bone when you cooked this dish like the rest of my family did. The fricassee works great with pork neck bones, oxtails, or with marrowbones that still have some beef on them (I usually look for “soup bones”). The broth is thickened a little at the end with gumbo file. You can buy that commercially at your local grocer or, if you don’t enjoy the taste of cardboard but do enjoy the taste of fresh mangoes in a deciduous forest on a warm fall day, you can find a sassafras tree, grab some leaves, dry them in your oven for an hour or so, and grind them in your food processor. Properly stored, this will last months in your fridge. Start by covering your meat/bones with your favorite Cajun seasoning. I prefer to make my own with salt, pepper, thyme, parsley, red pepper, and a little file. Roast the meat until brown. Use the rendered fat to make a dark brown roux. If you don’t know what that is, google it. Preferably before you start making this dish. To your roux, add equal parts onions, green peppers, and celery (the Cajun “trinity”). Cook your trinity until glassy and then add garlic, green onion, and curly parsley. Save some of the green onion and parsley to add at the end. Stir in a few cups of beef stock, toss in the bones, and then add about half a bottle of decent, dry red wine. Reserve the other half of the bottle as this will need to simmer for an hour or so and that is really boring without half a bottle or so of wine. Cook some long grain rice, carefully following the manufacturer’s directions. Then throw all of the things you have cooked in a bowl together. 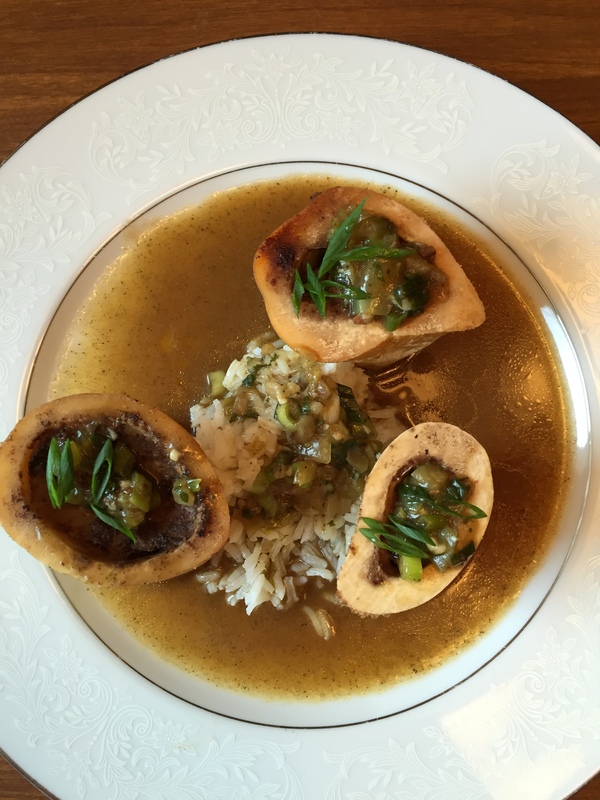 Scoop out delicious gobs of fatty marrow from the middles of the bones and stir those gobs right into your rice. Don’t be scared… unless you believe your cardiologist’s warnings. And just ignore that unsettling feeling you get in your lower GI, about 45 minutes after you eat this and gently slip into a wonderful fat coma.